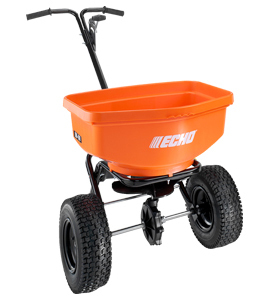 Echo unveiled its RB-80 and RB-100S large-capacity turf application spreaders. Featuring sturdy steel frames and maintenance-free gear casing, both models are intended for turf applications such as seeds, fertilizers, herbicides and pesticides, but can also be used for other free-flowing materials such as ice melt. The spreaders’ oversized hopper contains a patented auger to help aid clumps of material to flow. The large blade design pulls material towards the opening and is double fastened onto the gear cases so it doesn’t come loose. Additionally, the spreaders’ four-pattern spread control mechanism comes standard on both models. Users have the option to use a standard full spread, a left pattern spread, a right pattern spread and a narrow spread for more precise applications. The spread pattern is easily adjusted with the pull of two tabs located under the hopper, according to the company. The RB-80 and RB-100S are both backed by Echo’s standard five-year consumer and two-year commercial warranty.